Vermont has seen a wonderful explosion of vineyards in the past years. 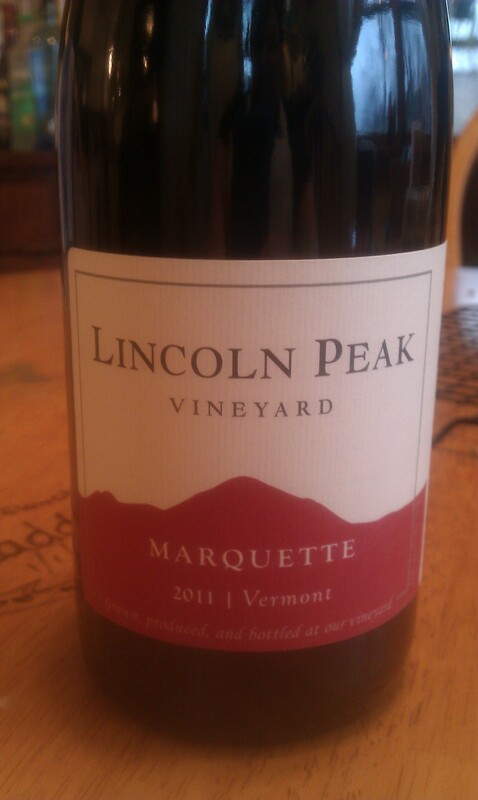 My favorite, being a local place called Lincoln Peak Vineyards. When I say local, I mean very local. The owners have been farming the land for years, first as a strawberry farm and now grapes and one of them still teaches art at the school my kids go to. It’s refreshing to walk into a place and know have the owners know your first name. It’s even more refreshing to see them out and about and have them chat you up. They’re just fantastic people, all around. 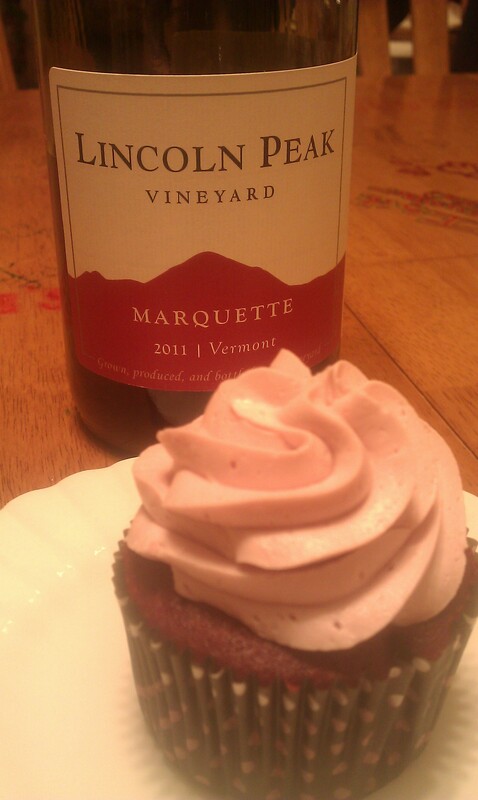 I’ve tried all the wines they’ve carried and the Marquette will always be my favorite. I don’t care for dry red wines at all–never have. If this is dry red, I’m unconvinced, but only in the most positive of ways. Marquette is such a versatile, easy going, laid back varietal that goes well with steak, chicken, pizza, cookies and that bar piece of chocolate at the end of the day. I decided to stop in to the vineyard on the way home from work (I told you it was that local), and pick up a bottle of my beloved Marquette. The owner, Chris, greeted me by name, and with a genuine smile, asked me how work was. We chatted a bit and I told him of my newest endeavors in the blogging world. It was at that moment that the ideas started spinning around in my head. I was determined to use this wine for more than drinking this evening. I assured him that I was going to use this in some sort of cupcake concoction. As much as I enjoy chatting with the owners, I couldn’t get home fast enough. I needed to grab this inspiration and run with it. I finally found a recipe that looked promising but one that I could easily make into my own over at teacher-chef.com. 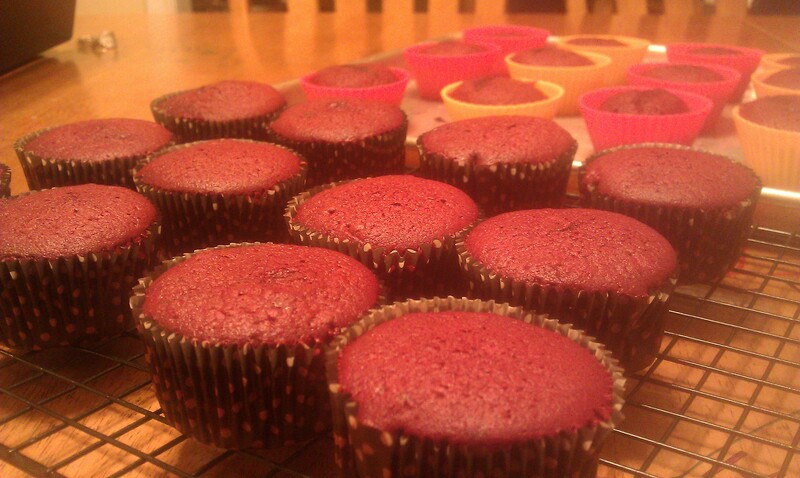 I didn’t have any chocolate cake mix in the house but I had just picked up a box of Red Velvet, on a whim. Why not use that? In my mind, it’s always been chocolate cake with a ton of red food coloring. 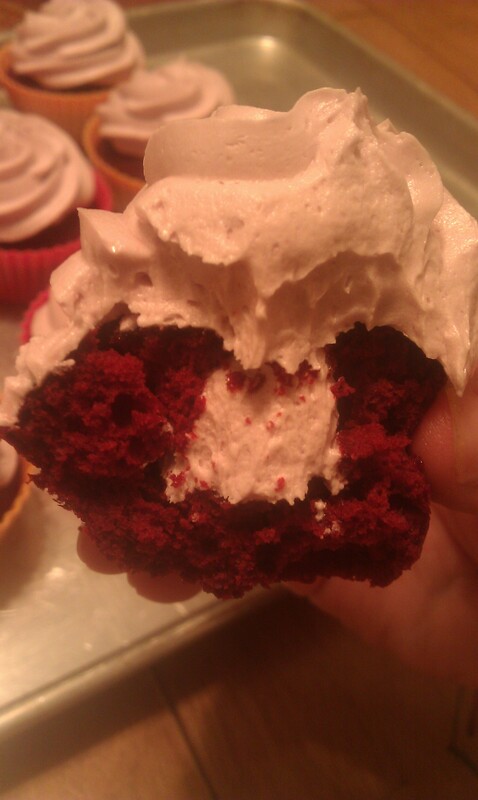 Red Wine, Red Velvet. It seemed appropriate. I recipe said to reduce “about two cups” of red wine by half. In hindsight, I’ll do three cups next time. The recipe said to use the reduction in place of the water in the cake recipe and my recipe called for a cup and a quarter and another quarter cup for the frosting. Math is not my favorite subject but my “wine math” said that there wasn’t going to be enough wine. You’re panicking, aren’t you? It’s okay, breathe. There’s another bottle of Marquette in my wine rack. The recipe mentioned that I’d either have to skimp or double the batch. Who skimps on frosting? Not this girl. I measured out enough reduction to make a double batch of frosting and just topped off the deficit with wine straight from the bottle. I’ve found that my oven runs about 5-10 degrees below the controls but no matter how carefully I watch the temperature, my cupcake bottoms always burn in a metal pan. I’ve since put it in a permanent time-out. I have a Pampered Chef muffin pan and it’s never steered me wrong. Downside: I only have one stone pan. 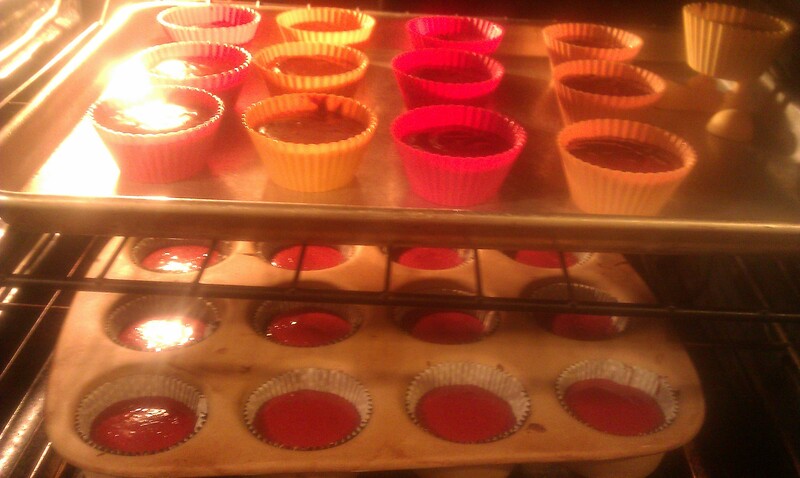 Solution: Free-standing, silicone baking cups. We’re back in business! Even though there was only a little over a cup of wine in the batter, it smelled right boozy. I knew I was on to something good. The cupcakes turned out light, fluffy and moist. I may have tried a bite, while they were still warm. I even talked my brother into sharing the other half. 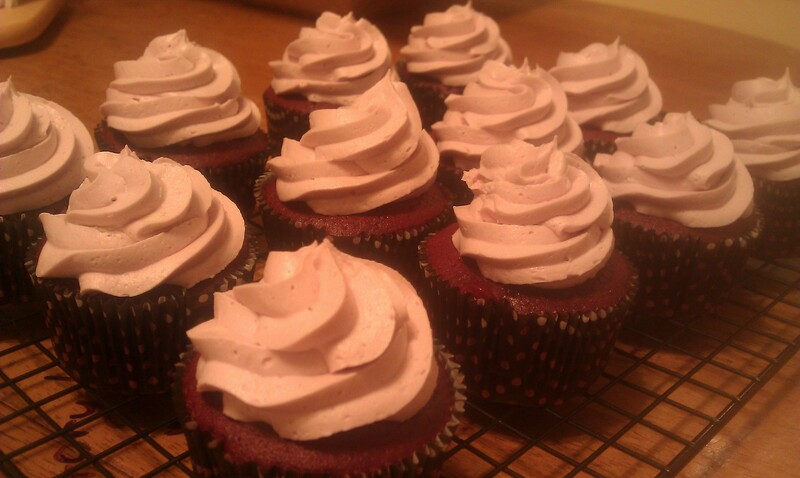 The frosting recipe was a simple, butter/shortening buttercream. 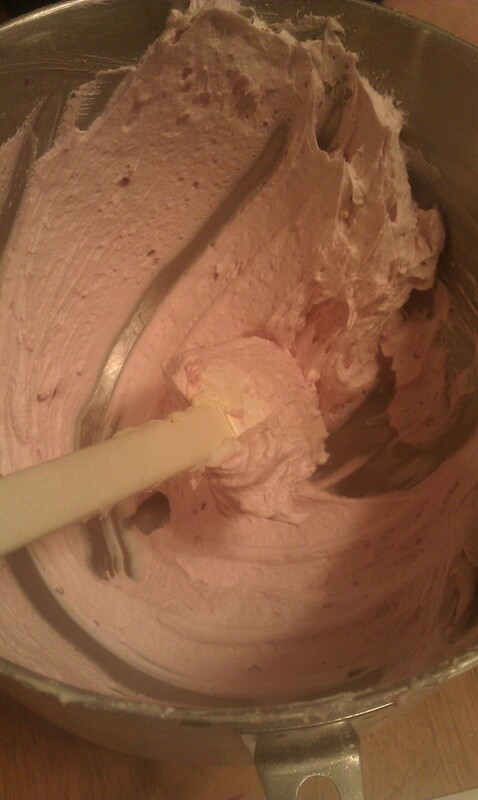 I much prefer using equal parts of unsalted butter and shortening in a frosting-it just holds up so much better. You get the hold of the shortening with all the taste of butter. The half cup of wine in the frosting turned it such a pretty shade of something between a lavender and light berry color. The wine taste isn’t overpowering, but a nice, light hint. I’m doubly glad that I doubled that frosting recipe. How else would I have filled 24 cupcakes, let alone frost them? 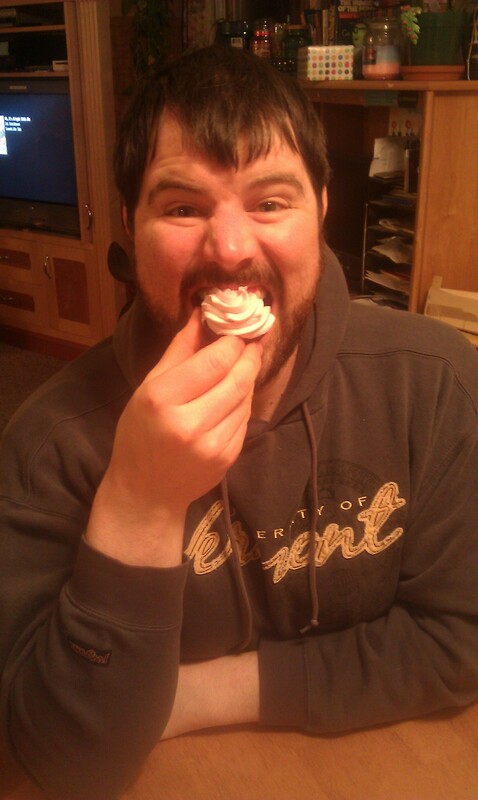 My brother, a very willing taste-tester. What’s better than a frosted cupcake? A filled and frosted cupcake. 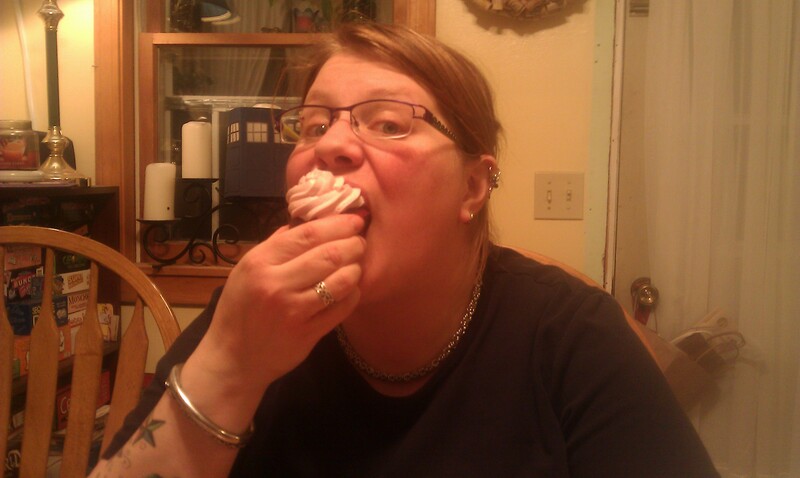 Biting into that first miniature cake was a treat. Fluffy, moist and the wine left such a nice taste in my mouth. Of course, the bottle was open and I poured myself another glass. Perfection. I wonder how the next batch will taste with a few semi-sweet chocolate curls, perched on top……. 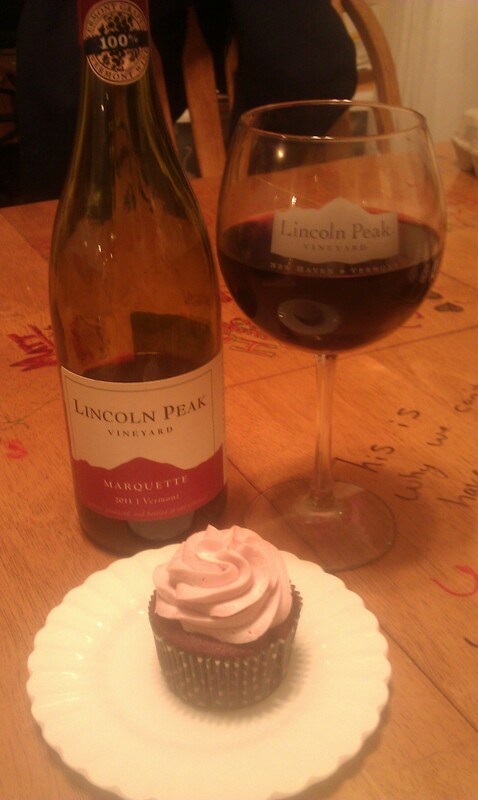 This entry was posted in baking, cupcakes, wine and tagged cupcakes, red velvet, wine.